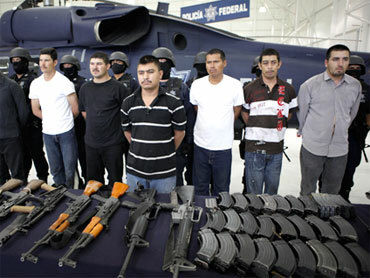 Edgar Valdez Villarreal is believed to be the chief hit man for one of Mexico's most brutal drug cartels. His nickname? "Barbie." That's right, the American fashion doll. Because the U.S.-born Valdez has blond, blue-eyed good looks. In Mexico's cutthroat drug underworld, "Barbie" shares the stage with such fearsome characters as "Bunny Commander" and "Smurf," "Taliban" and "Monkey." Mexican drug traffickers' nicknames run from flashy and threatening to surreal and downright goofy. Some reflect a thug's rank in his cartel, others simply a school yard taunt that stuck. Still others denote a reputation, such as the cartel leader known as "El Mas Loco" - "the Craziest One." And many, like "Barbie," contrast sharply with their real-world personas. The handles make police work tricky: Traffickers hide their identities by using different nicknames as well as credentials with assumed names. Law enforcement officials say they list as many aliases as they can for each suspect - sometimes as many as a half-dozen - because individual nicknames are often used by more than one person. For instance, several drug suspects are known as "El Gordo" - "Fatty." It also makes prosecution tough, since gang members who become protected witnesses often know their comrades only by their nicknames, making it harder to squeal. The monikers can be intentionally feminine - like "Barbie" - to make light of a trafficker before he proves his mettle, says Homero Aridjis, who wrote the novel "Hit Men." "Nicknames are like a second baptism, a social transformation into the criminal world," he said. Or they can come innocently in a culture with a penchant for doling out sobriquets, starting on the playground - like in the case of hit man Israel Nava, whose nickname "Oyster" followed him until he was killed in northern Mexico in April. "Theoretically, that would be a nickname for somebody who's closed, and doesn't talk much," said crime novelist Paco Ignacio Taibo II. "But that wasn't it. They called him Oyster in grade school because his father had a seafood stand." Colombia, which produces most of the cocaine trafficked through Mexico, has also long had a zeal for colorful nicknames. Colombian gunman Marco Tulio Moya was so effective before his 1999 death that he was called "Baygon," after the insecticide. "If you go into a poor neighborhood here and ask for somebody by their real name, you'll never find them," said Colombian novelist Juan Jose Hoyos. Many are as silly as Mexico's nicknames. Drug lord Pablo Escobar's brother, Roberto, is called "Osito" - "Little Bear" - because that was the name of a bicycle shop he once ran. A more serious system is used by Mexico's Zetas, a gang of ex-soldiers working as Gulf Cartel hit men, who opted for military style nicknames that start with a Z - police radio code for commander - followed by a number. Z1 through Z10 are founding members. Nicknames starting with the letter "L" are reserved for bodyguards and lieutenants, and also carry a number; the higher the figure, the lower in rank. Some hold on to their number even as they rise through the ranks, although Ivan Velazquez Caballero traded his lowly "L-50" for a more fearsome moniker, "Taliban." Authorities don't know why kidnapper Armando Santiago Orozco, arrested in Oaxaca state in January, is called "Bunny Commander." Cartel leader Alfredo Beltran Leyva, arrested last year, is "El Mochomo," a big, nasty biting ant from northwestern Mexico. Many of the traffickers revel in their nicknames. Steve Robertson, a veteran Drug Enforcement Administration agent, said smuggler Gilberto Ontiveros liked his nickname "El Grenas" - "Longhair" - so much that when he was imprisoned in 1989, he had fellow inmates make pins with artificial hair to sell to visitors.